The Hudson Valley’s Most Romantic Getaway! 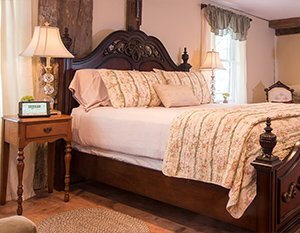 Enjoy a relaxing stay at Caldwell House Bed and Breakfast. Recently named a top 25 Bed and Breakfast in the United States by BedandBreakfast.com, and member of the prestigious Select Registry and Diamond Collection of Inns, our multi-award-winning, historic country Inn is located in Salisbury Mills, NY in the heart of New York’s lower Hudson River Valley – just five minutes from the Storm King Art Center and the Brotherhood Winery; ten minutes from Stewart International Airport, fifteen minutes from the U.S. Military Academy at West Point, the Orange County Choppers, and the Woodbury Common Outlets; and within approximately 60 minutes of NYC, the Culinary Institute, FDR and Vanderbilt Mansions in Hyde Park, Bethel Woods Center for the Arts, and New Paltz. Our guest rooms, with their luxurious linens and comfortable mattresses, will help ease you into a sound, blissful sleep. Enjoy all the amenities that each room provides – your own climate control system, large “Smart” HDTVs that include access to DirecTV, Netflix, Hulu+, free Wi-Fi access, iHome clock/radio/docking station, and much more! Depending on the room you choose, you can take a relaxing Jacuzzi bath or an invigorating shower in your private bath, which includes top-of-the-line Gilchrist and Soames toiletries. Snuggle up to a fire in one of the ten guest rooms that have in-room fireplaces. Awake each morning to a full three-course homemade breakfast in one of our two formal dining rooms. Any special dietary needs are happily accommodated including Vegan, Vegetarian, Gluten-Free, etc. (Please just let us know in advance, so we can guarantee that we have the freshest ingredients on hand). Specialty coffees, teas, soda, and snacks are available 24 hours a day. Kitchenettes complete with full-sized refrigerators, microwaves, and Keurig machines are available to guests in both the Main House and the Carriage House. In the Connemara House, kitchenettes are available in each room. After breakfast, explore local art and history at one of the many museums in the area including the many historic mansions along the Hudson, the West Point Museum, DIA Beacon or the Storm King Art Center. During the warm weather months, take a trip to Bethel Woods Center for the Arts, the performing arts center and museum located at the site of the 1969 Woodstock festival, where many great concerts and performances are held. 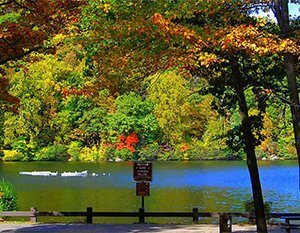 Find year-round outdoor adventure: hike or bike the many area parks and trails, explore the Hudson River by cruise ship or kayak, go apple picking, hot air ballooning, horseback riding, ice skating or downhill skiing. Shopping enthusiasts will love to spend time exploring Woodbury Common-the largest designer outlet center in the U.S, or the wide variety of antique shops and farmers’ markets. The Hudson Valley was the first wine-producing region in the United States and is proud to be home to the country’s oldest winery – Brotherhood Winery – that is less than 2 miles from the inn. We are within easy reach of all 14 Wineries on the Shawangunk Hudson Valley Wine Trail. In addition, several fantastic microbreweries thrive here in Orange County and, recently, makers of distilled spirits have opened, providing an interesting combination of local tastings and tours to choose from. And, if it is a taste of the “Big Apple” you seek, you can take a day trip by train or car into New York City, just 60 minutes away. Upon your return to the inn, unwind with a glass of wine on the same wrap-around front porch the Caldwells used two centuries ago, or sit in the parlor with a hot cup of tea and read a book while a crackling wood fire keeps you warm. Looking for a little “at home” fun? Stroll over to the Living/Game Room and play chess, checkers, Scrabble, card games, or any number of games we provide. However you choose to spend your days, we are sure you will enjoy a relaxing and romantic stay at the Caldwell House. Caldwell House Bed and Breakfast is frequently in the news! Check out some of our coverage below. Once you’re finished browsing our site, book a trip through our online reservation system, Fall is arriving in Hudson Valley – it’s a great time to visit, so come see us soon!